I have so many clients that struggle with their porches. They know what they want but aren’t sure how to pull it all together. Porch weather here in the south is about 9 months long so it’s important to have one that you love to spend time on. We offered a mini makeover a couple of month’s back to show you how I design and decorate a porch to hopefully inspire you to make some changes and bring your personality and style to the front of your home. We had lots of great entries and it was really hard to pick one but I fell in love with this historic home’s entrance and knew I could bring it to life and make it an area that the homeowners would enjoy relaxing and entertaining on. The bones of the porch were good but it really lacked personality and style. The homeowner wanted a place to enjoy her morning coffee but also be able to entertain guest. I got a good sense of her style by the beautiful decor inside and knew that with just a few changes and some additional pieces here and there, we could bring her vision to life and make the front porch a charming place to sit and sip the afternoon away. Here is the after. 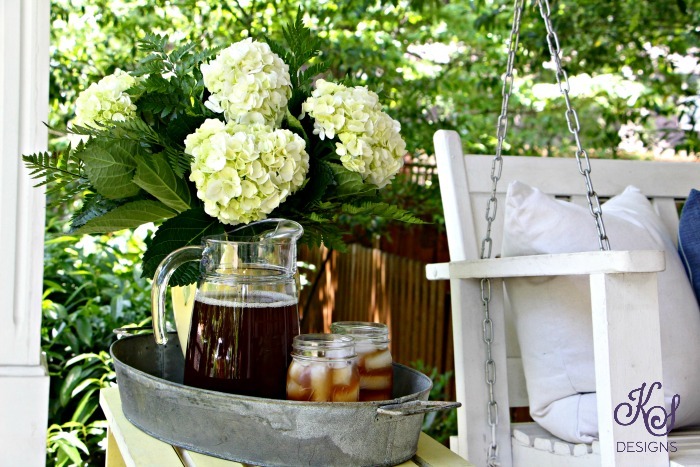 Things a southern front porch should have are a rocking chair or two, a swing, a place to put your feet up and a place to put your drink down. It must feel comfortable and well-loved and be a place that welcomes guests into your home. A screen door just about makes it perfect if you ask me! I started with new fabric for cushions and pillows. We wanted to keep the vintage feel of the original fabric but add some color and pop to the space that it was lacking. The blue and white floral print was the perfect choice and the inspiration for the rest of the decor. Next was furniture placement. Just like the inside of your home you need to consider how you want to use the space and then design the layout to accommodate that. This side of the porch is for entertaining. I created a conversational area by moving the chairs and anchoring the furniture group with a rug. I took the old wicker ottoman and gave it new life with a couple of coats of spray paint and a new cushion. Now it is a great place to rest your feet or it can be pulled over to use for seating when guests are over. The homeowners wanted a place to eat on the porch so I found this galvanized round table that is just perfect to serve breakfast for two or cocktails for a crowd. The small tables beside the wicker chairs are stools that can be pulled up to the table as well. Make sure to use pieces that have multiple uses when pulling a space together. We moved the table over for lunch on the porch with the neighbors. Every southern woman can pull together a delightful lunch when the ladies come over to visit. 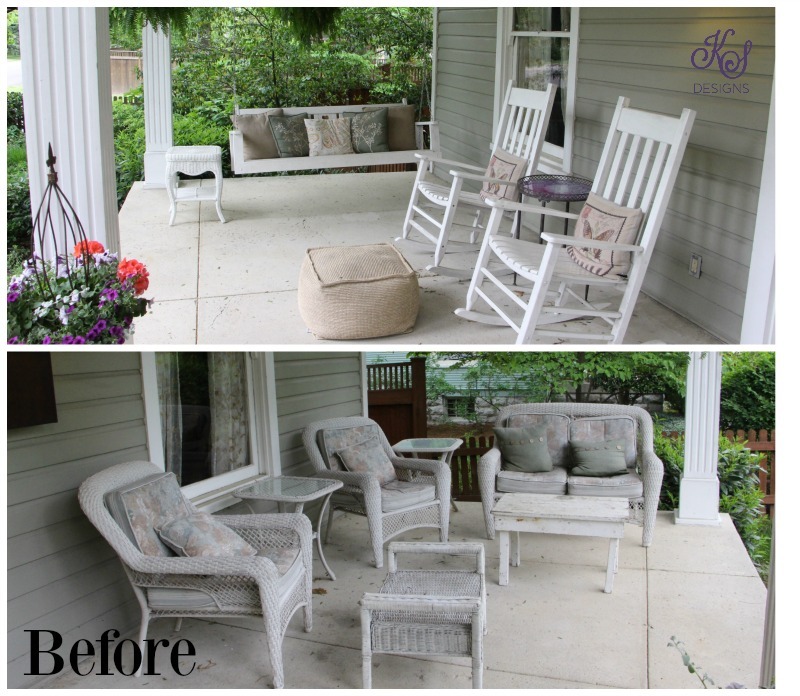 New cushions gave these chairs just the punch they needed to add charm to the porch. I designed this side of the porch for morning coffee and quiet time for reading or watching the world go by. I found an old bench that serves as both a table and footstool for the rocking chairs. I wanted it to be skinny so it didn’t take up much space and could also be used for additional seating when needed. I used a rug matching the other side to anchor this seating area too. Pillows and a throw make this swing a great place to curl up and read a book. I added an old yellow table that I found on one of my picking trips by the swing. I put a tray on top to make serving drinks easier and flowers are always a good idea, don’t y’all think? I added blue containers and a smaller rug to pull the color palette to the front door. The topiaries added height and soon the ivy will fill in and add texture. I added shade-loving flowers and put them in rusty olive buckets. Rust is my favorite accessory and I use it wherever I can. The burlap wreath can be used for all seasons and the galvanized welcome sign adds a touch of southern hospitality to the porch. The last things that needed a bit of rearranging were the steps. I brought the large flower filled urns down to make more of an “entrance” then added the rustic lanterns for the big wow factor. They are spectacular at night with the glow of the candles. 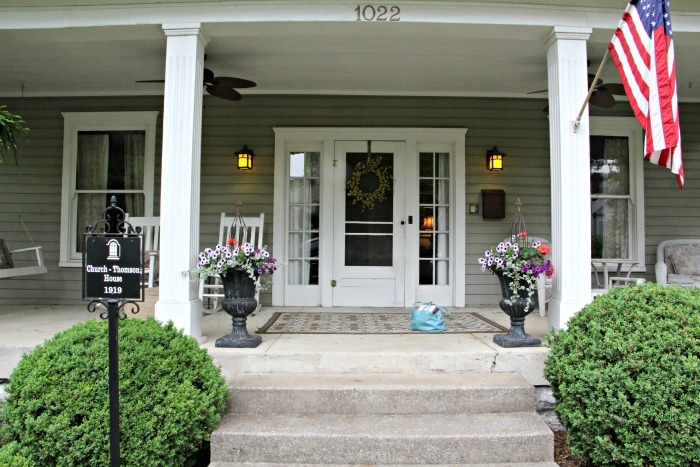 I hope you are inspired to freshen up your porch decor and add some style and personality to your entrance.